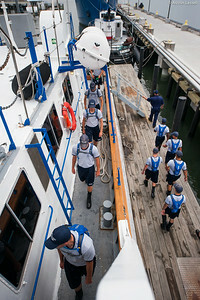 USMMA 2nd Company candidates boarding Training Vessel Liberator for an underway class on July 14th, 2014 as part of indoctrination at the Waterfront. 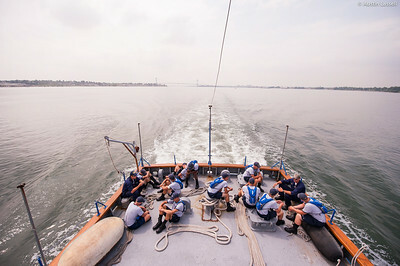 During underway class, the vessel, Liberator, is taken out to open water and candidates are taught the very basics of performing duties on a large vessel. This includes the challenges of recovering a man over board in a large vessel, understanding the importance of stations, what to do during a medical emergency, navigation, and maneuvering. 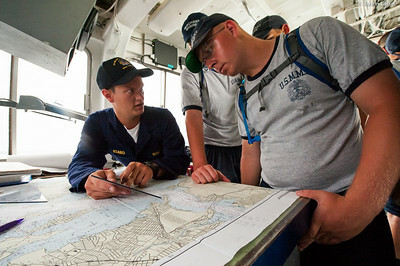 Midshipman Asaro 1st Classman teaching navigation to a USMMA 2nd Company candidate during an underway class on the bridge of the Training Vessel Liberator on July 14th, 2014. Given that the larger the vessel the larger the consequences are for an error, maneuvers must be well thought out and planned. 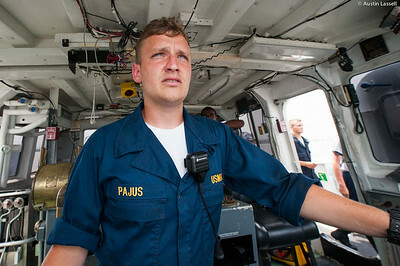 Midshipman Paul Styx 1st Classman comments on navigational duties on a large vessel to 2nd Company Candidates during an underway class on the bridge of the training vessel Liberator July 14th, 2014. Captain Jonathan Kabak comments on navigational duties on a large vessel to 2nd Company Candidates during an underway class on the bridge of the training vessel Liberator July 14th, 2014. 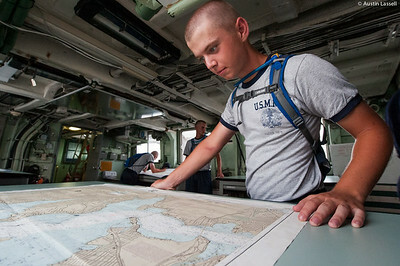 A USMMA 2nd Company candidate puruses a navigation chart in the classroom of the training vessel Liberator during an underway class on July 14th, 2014. Given that the larger the vessel the larger the consequences are for an error, maneuvers must be well thought out and planned. 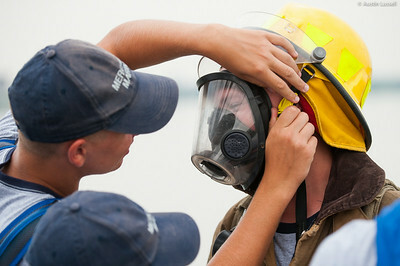 A USMMA 2nd Company candidate helps a fellow candidate remove a fire suit during fire training on the Training Vessel Liberator during an underway class on July 14th, 2014. Fires on a ship are no small matter as the only place to escape to is the water. 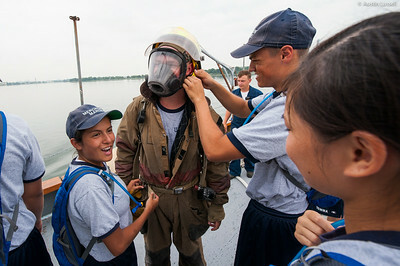 A USMMA 2nd Company candidate removes a fire suit following fire training during an underway class on the Training Vessel Liberator on July 14th, 2014. 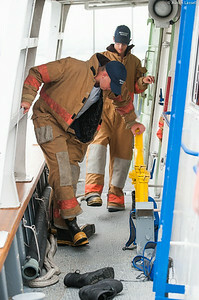 Fires on a ship are no small matter as the only place to escape to is the water. 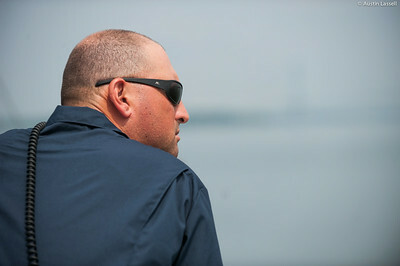 A USMMA 2nd Company candidate listens intently to Midshipman Ed Pajus 1st Classman speak about fire training during an underway class on the Training Vessel Liberator on July 14th, 2014. 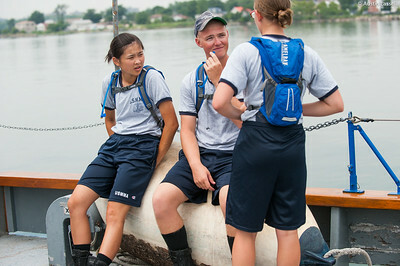 USMMA 2nd Company candidates sit on a large dock bumper and speak to each-other awaiting their next class to be taught on the Training Vessel Liberator during an underway class on July 14th, 2014. 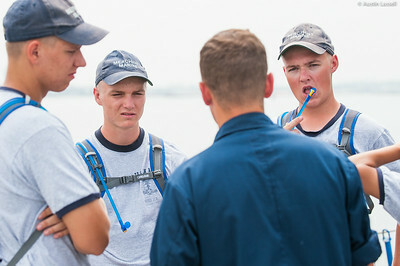 USMMA 2nd Company candidates listen intently to Midshipman Ed Pajus 1st Classman speak about fire training during an underway class on the Training Vessel Liberator on July 14th, 2014. 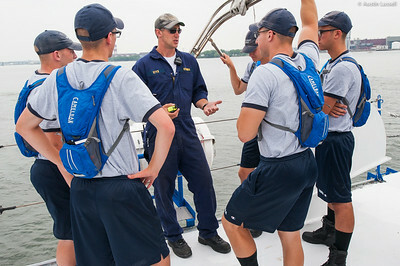 Midshipman Sam Hagen 3rd Classman speaks to USMMA 2nd Company candidates on the importance of certain types of lifejackets during an underway class on the Training Vessel Liberator on July 14th, 2014. The life jackets shown are shaped such that the head of the person wearing the jacket will be held above the water, should they become unconscious. 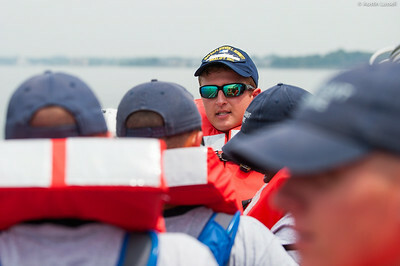 A USMMA 2nd Company candidate pauses momentarily while listening to Midshipman Sam Hagen 3rd Classman speak on the importance of different lifejackets during an underway class on the Training Vessel Liberator on July 14th, 2014. 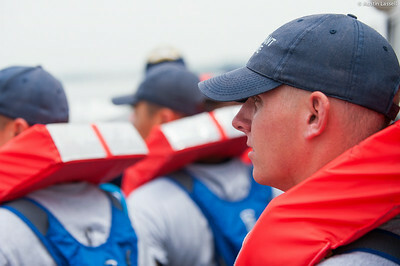 The life jackets shown are shaped such that the head of the person wearing the jacket will be held above the water, should they become unconscious. 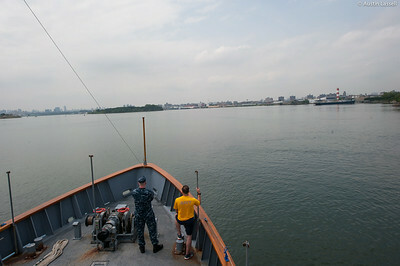 Two military servicemen stand on the bow during an underway class on the Training Vessel Liberator on July 14th, 2014. 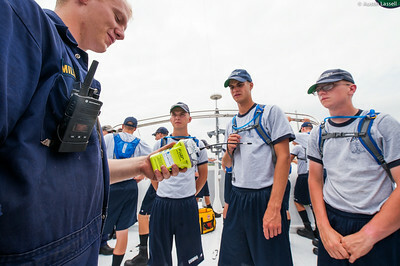 Midshipman Tyler Redinger 1st Classman teaches 2nd Company candidates about the use the EPIRB (electronic position indicator radio beacon) during an underway class on the Training Vessel Liberator on July 14th, 2014. The EPIRB is used for alerting port state authorities the location of the abandoned ship during an emergency. 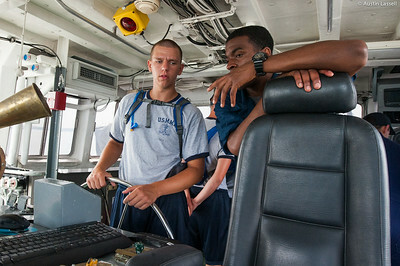 Midshipman Alex Miller 3rd Classman teaches 2nd Company candidates about the use the EPIRB (electronic position indicator radio beacon) during an underway class on the Training Vessel Liberator on July 14th, 2014. The EPIRB is used for alerting port state authorities the location of the abandoned ship during an emergency. USMMA 2nd Company candidates stand on the stern of the ship and listen to Midshipmen teach about numerous emergency signaling devices on a large vessel during an underway class on the Training Vessel Liberator on July 14th, 2014. 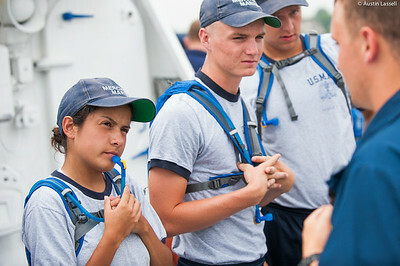 Midshipman Paul Styx 1st Classman teaches 2nd Company candidates about the lifeboat vhf radio. 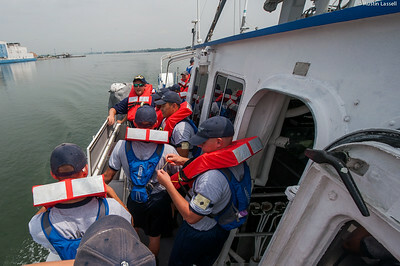 during an underway class on the Training Vessel Liberator on July 14th, 2014. The lifeboat vhf radio is used for communicating from lifeboat to ship during an emergency. 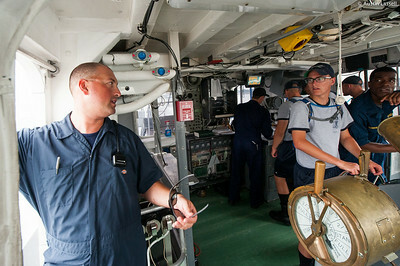 Midshipman Asaro 1st Classman practicing being in charge of the con and Midshipman Samuels 3rd Classman at the helm with Captain Jonathan Kabak overlooking during an underway class on the Training Vessel Liberator on July 14th, 2014. 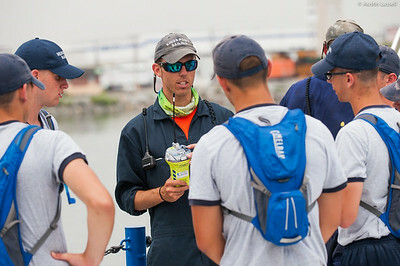 While both midshipmen are not first timers, but actually in charge of helping run indoctrination events at the Waterfront, there is always much to be learned and practice makes perfect. 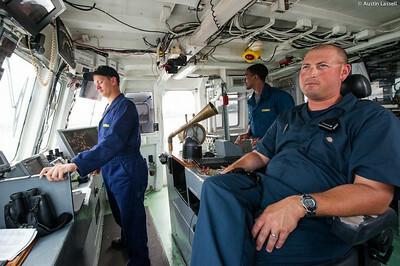 Captain Jonathan Kabak assists with lookout in the navigation of liberator during an underway class on the Training Vessel Liberator on July 14th, 2014. 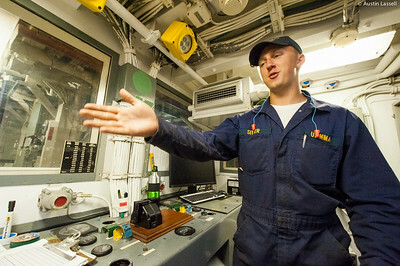 Midshipman Ed Pajus 1st Classman practicing being in charge of the con during an underway class on the Training Vessel Liberator on July 14th, 2014. 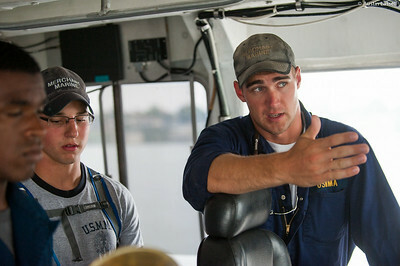 Midshipman Samuels 3rd Classman speaks with a USMMA 2nd Company candidate who is at the helm during an underway class on the Training Vessel Liberator on July 14th, 2014. Midshipman Nick Sitter 1st Classman in the engine control room, ECR, during an underway class on the Training Vessel Liberator on July 14th, 2014. Midshipman Sitter is practicing being in charge of the engine room. The purpose of the ECR is to monitor and ensure the proper operation of not only the engines, but also generators, and relay related information to the bridge. 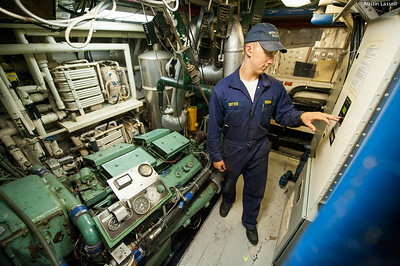 Midshipman Nick Sitter 1st Classman checking the status of one of Liberators two twelve cylinder Detroit Diesel, diesel engines during an underway class on the on July 14th, 2014. Midshipman Sitter is practicing being in charge of the engine room. 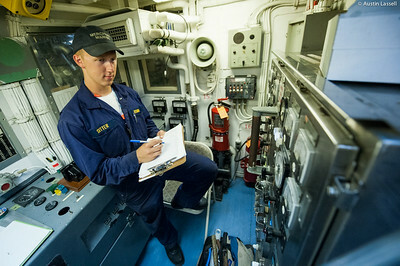 Midshipman Nick Sitter 1st Classman monitors the ship's electric panel in the engine control room during an underway class on the on July 14th, 2014. Midshipman Sitter is practicing being in charge of the engine room. 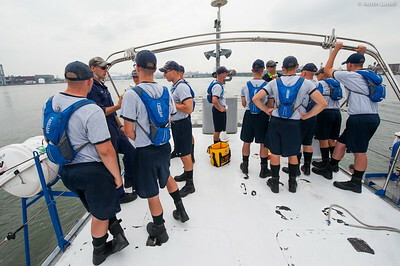 USMMA 2nd Company candidates sit on the stern of the ship and listen to Midshipmen teach during an underway class on the Training Vessel Liberator on July 14th, 2014. 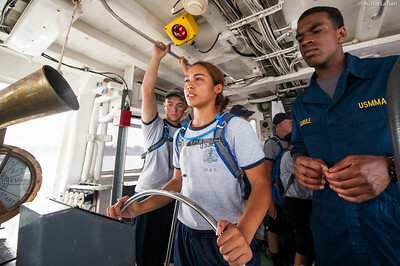 Midshipman Samuels 3rd Classman overlooks as a USMMA 2nd Company candidate is at the helm during an underway class on the Training Vessel Liberator on July 14th, 2014.